November 2015 • SMT Magazine 99 5 ImI Automotive Cameras inside renesas' ADAS Surround view Kits Integrated Micro-electronics Inc (IMI), one of the leading providers in the world of electronics manufac- turing services, is providing the automotive cameras for the Advanced Driver Assistance Systems (ADAS) Surround View Kit of renesas electronics, a supplier of advanced semiconductor solutions. 6 SmTC moves Corporate HQ to San Jose, California SMTc corp. has announced that its San Jose, california location will become the new corporate headquarters. Its Toronto, canada location will be known as the SMTc Toronto Division and will re- main an important part of the organization repre- senting several "centers of excellence." 7 Scanfil Changes outlook; expects better 2015 Performance Scanfil has revised upward its estimate for turnover and operating profit in 2015 amid better than ex- pected sales during the third quarter. 8 vexos Strengthens Technical Capabilities with New Panasonic Lines vexos and panasonic have entered into a technol- ogy evolution agreement, ensuring vexos remains one of the leading providers of SMT placement and manufacturing capabilities worldwide. 9 eSCATeC Focuses on Designing out emC Issues eScATec has just completed an intensive train- ing course for its design engineers that focused on the causes of eMc and how to prevent it. The initiative follows on from the company's invest- ment earlier this year in state-of-the-art eMc test- ing equipment. 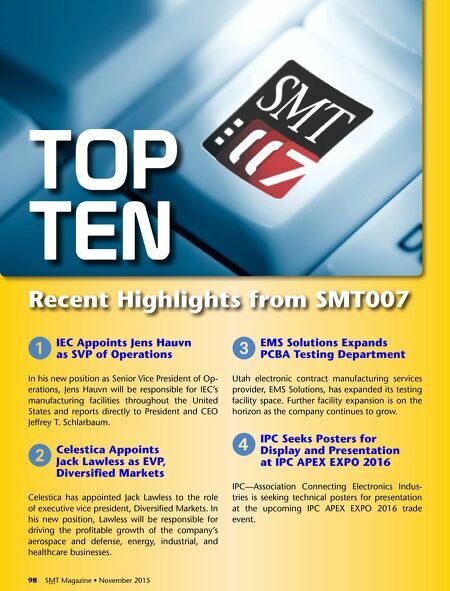 J exclusive video Coverage of SmTAI 2015 if you didn't make it to chicago for SMTA interna- tional 2015, don't despair. We have complete real Time video coverage of the event, so you won't miss a thing. 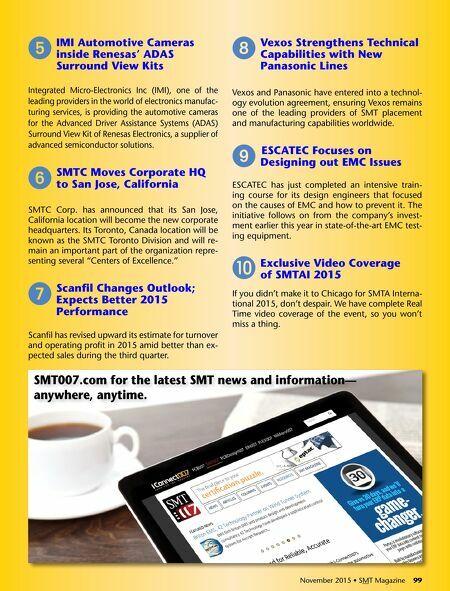 November 2015 • SMT Magazine 99 SmT007.com for the latest SmT news and information— anywhere, anytime.